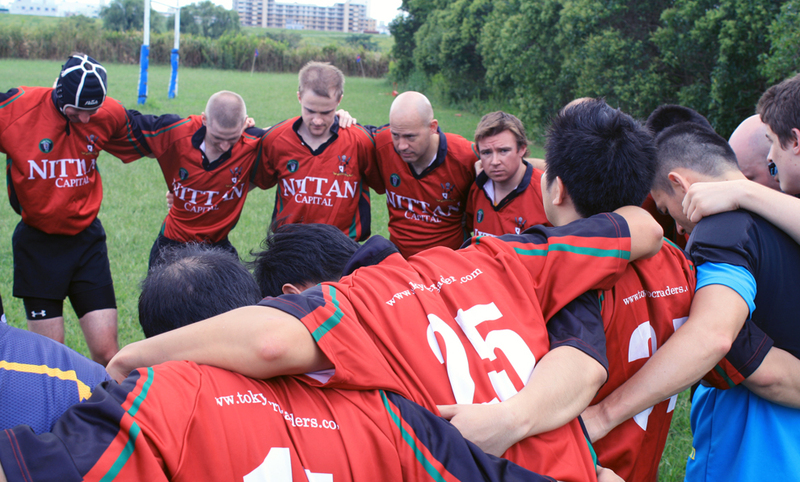 Our first match of the season finally arrived last Sunday where a healthy and unheard of number, with over 20 eager Crusaders headed out to Saitama to do battle with the unknown Dasewa line up. After our cross-country trek to the ground and losing a few of the shorter members of the squad to pot-holes near the pitch and others to malaria from mozzie bites we managed to assemble a good quality line-up for the game ahead. Anthony Q, Kaj, Sean G, Alex D, Sean W, Crazy Kim and Alex H in the forwards. Ev (c), Travis, Gaz, Neil, Phong, Yorkie, Benji in the backs. The Cru started the game well with the forwards punching it up the middle, retaining the ball at ruck time and linking well with the backs who were catching the ball cleanly and running through holes. The unorthodox Crusaders start soon ended though as we went back to our old habit of making it hard for ourselves: throwing silly passes, not taking the contact, over committing and being lazy at ruck time, too many people running out of the defensive line and not enough communication. This period of lapses saw us give away many easy yards and gaps to the opposition who, with their under-handed, dastardly plan of being fitter and quicker than us soon paid dividends. Quick ball spun from side to side saw gaps a plenty open up and only some gutsy defense saw us keep the damage down to 2 tries in the first half. We hit back after going back to the game plan of keeping it tight and simple (insert your own punch line here). Forwards running in numbers, making the gain line and giving quick, go-forward ball to Trav saw us make our own gaps as Phong, Benji, Neil and Yorkie all made breaks in the back line. 2 great tries coming off slick backline moves were finished off by Kaj and Phong and at half time we were locked in at 12-12. With confidence in our superior fitness and conditioning from Saturday night’s binge-hydration we were confident the win was there for the taking. After weathering a Dasewa storm early on it seemed that victory was possible after a fantastic team try. A turnover ball with Dasewa on the attack in our 22, saw the forwards punch a hole through the middle, Crazy Kim breaking out of tackles and popping to our new recruit on the wing, Ryosuke whose Campese-esque swerves in and out drew in numerous defenders before popping a miraculous pass over the head to the on-coming Yasu who scored under the posts. Advantage Cru! The last 20 minutes however were a different story! Many of us possibly over-hydrated the night before and as we swung a few changes to give our newer players a go, our communication and combinations started to fray. Lots of turnover ball at ruck time, line outs and knock ons gave the opposition way too much ball. They made the most of some mis-matches out wide and our defensive line (a line is possibly not the most accurate of descriptions!) was easily punctured as the opposition went on to score a few late tries through tired defence and go on to take the win by 2 tries. Given this was our first game of the season though there were lots of positives to be had. We had an amazing 7 guys made their debut for the Cru! Welcome and well done to Ryosuke, Bo, Phong, Marcus, Sean W, Kaj, Benji. Some guys were playing their 1st or 2nd game of rugby ever and considering that we did pretty well. We can only get better and as guys get more experience and our combinations and communication improves we will certainly be a force to be reckoned with this season. Special mention goes to Anthony Q for propping through the whole match in only his 3rd or 4th match ever and to the youngsters Sean W and Marcus for showing us all how it’s done.